'Cassleigh', the Augustus Cass Canfield estate designed by McKim, Mead & White c. 1902 in North Hills. Canfield was the son of Capt. Canfield of the United States Topographical Engineers and on his mother's side was grandson of Gen. Lewis Cass, Secretary of War under Andrew Jackson. He was a designer of schooners and was a prominent club and yachtsman. Canfield died in 1904 before the house was completed. His wife went on to remarry in 1907 and lived on the estate until 1915. 'Cassleigh' was later purchased by John Dennis Ryan who renamed the estate 'Derrymore'. Ryan was chairman and president of Anaconda Copper Mining Co. and president of the Montana Power Co. among numerous other positions. 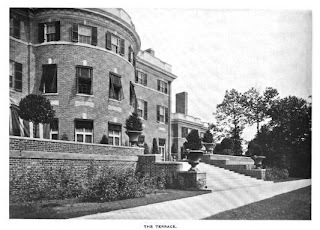 The residence was demolished c. 1940 and part of the property now makes up Christopher Morley Park, click HERE to see the location on google earth. Photos from Scientific American, 1905. Marvelous obituary---It focuses on his social and sporting accomplishments and it never does anything so vulgar as to actually mention how he financed his big houses and his yachts. I assume that he was the father of Cass Canfield the publisher (who himself lived in a handsome Mott Schmidt house in Mt. Kisco), and was grandfather of Michael Canfield, the first husband of Princess Radziwill? McKim, Mead & White turned out so many masterpieces. This big pleasant dull house with its handsome interior was not one of them. 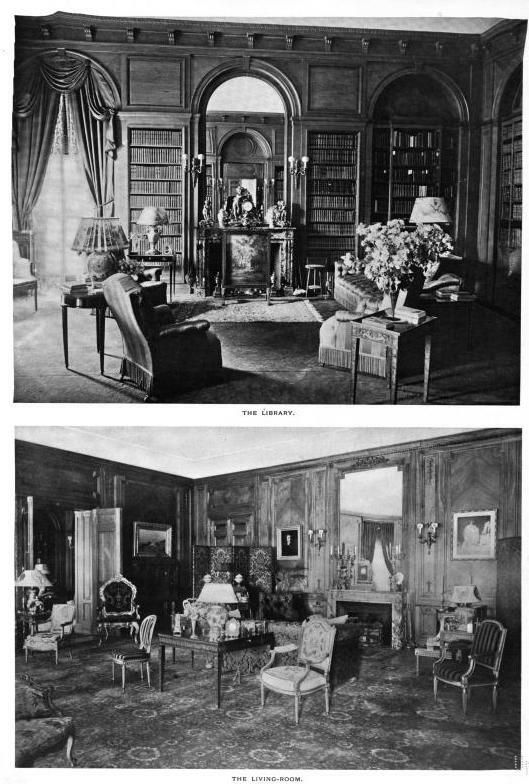 "This big pleasant dull house with its handsome interior..."
This does look like something McKim phoned-in, doesn't it? You can just see him sitting down with two or three staff architects, providing a general description of what he wanted, and then dropping by periodically to check on their progress. It seems that McKim, Mead & White struggleg somewhat when interpreting the Georgian style in mega mansion scale. I think of Florham in New Jersey as another example of a house in the same vernacular that seems to "miss the boat". Not terrible, mind you, just without the firm's expected flair. But perhaps it's unfair to draw a conclusion from two houses among a huge body of work that is nothing short of spectacular. Interesting to note that both Canfield and his father died at the ages of 50 and 53 but his son lived to the ripe old age of 89. They both appear to have died of pneumonia -- in a world without antibiotics. 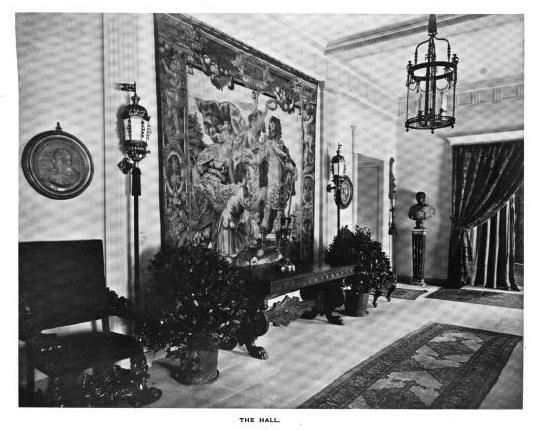 Speaking of Frank Gray Griswold ('clubman, sportsman'---Mrs. G. obviously liked her men outdoorsy): Those of Zach's readers who consider architectural criticism a valid and interested discipline might be interested to know that his sister, the former Mrs. Canfield's sister-in-law, was Mrs. Schuyler van Renssalaer, the first woman architectural critic, and a great champion of H. H. Richardson, among others. I wonder what she might have had to say about her sister-in-law's house? I would LOVED to have lived here ~ and that goes for Florham as well ! I think houses like this are quietly spectacular. 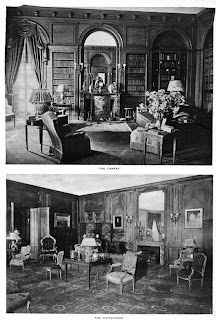 I would also liked to have lived at The Breakers or Ochre Court too ~ and they're GRANDLY spectacular ! As in an old Ray Bolger song . . . "When I'm not near the one I love, I love the one I'm near." 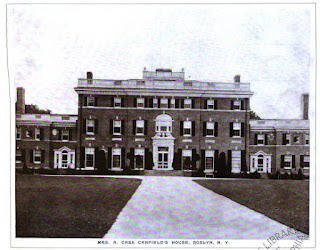 oh, and one of Cass Canfield's wives was a great niece of Mrs. Stanford White. I think we've got most of the degrees of separation covered now, don't you? I think we've got most of the degrees of separation covered now, don't you? Sounds like a problem for an epidemiologist. A little off topic, but I have confirmation from two sources -- one of them the designer that did the room for the designers showcase- The Mirrors in the Overdoors in the drawing room at Bogheid are 100% original to the house. So the mirrors were sparkly deco touches within the Georgian segmental arches of the overdoors---and once upon, it all made sense as Delano designed. I'll be darned. 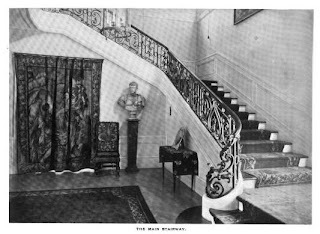 sparkly deco touches exactly -- D&A had a few moments like that -- have you ever seen photos of the "Sert Gallery" at Chelsea? Deco madness.. Aluminum & mirror with back lights! With ebony, ivory & Lalique fan sheped sconces on top. "The Mirrors in the Overdoors in the drawing room at Bogheid are 100% original to the house." BCD- Was there an indoor swimming pool at Bogheid? Two contemporary Newspaper articles (the NY Times and Brooklyn Eagle) reported that the house contained an indoor pool and squash courts as well as the indoor tennis court. I never explored the tennis court wing, as it was being used to store equipment by the City of Glen Cove at the time and was locked up pretty tightly. If I recall as well, you entered the tennis court from the house via a gallery that ran along the west side of the court about 15 feet above the court (it had clearly been a viewing gallery). The gallery had almost totally collapsed, if I remember, and what was left of it was in such visibly bad shape that it deterred even idiotically fearless youngsters like my friends and me from exploring the court and its surroundings. I'd love to know what else was in there. By the way, the 1937 cost of Bogheid, apparently lifted by the NYTimes from the building permits was $250,000. $250,000 clearly went a long way in America in the midst of the Great Depression. "By the way, the 1937 cost of Bogheid, apparently lifted by the NYTimes from the building permits, was $250,000." Pudding. Think the mirrored overdoors were billed to Sauce? Am often amazed at how short-lived man of these houses were. Built in 1905, torn down only 35 years later. Built for posterity, I assume, but unwanted and unlivable within only decades. Although $250,000 indeed went much further then than today, please note that costs reflected on the permits are just for the basic construction and not the total finished cost. The same practice holds true today. Names, please. It is too late to shield the innocent. Cassleigh must have made a formidable impression. The main facade seems to be based on Wimpole Hall, in the UK. What a terrible loss for Long Island! I grew up in Roslyn Estates in the 1940's and 50's. I lived directly across the road from "Black Ink" pond in a house that was built in 1910. A lot of the early houses in Roslyn Estates were built in the vicinity of the pond with the first home in the neighborhood being built in 1893 next to the pond. As kids we used to play around "The Ryan Estate" which was abandoned but still standing in the early 1950's. At the time it was held that Ryan bought it as a wedding present for his daughter but she didn't like it and never lived in the house. A 1906 map of Manhassett and Roslyn shows the estate and only house in Roslyn Estates which was the one next to Black Ink. The area including Roslyn Estatesias shown on the map as the Appleby Estate.